A few days ago I wrote about rumored changes to Walmart’s policy regarding prepaid pin enabled debit (gift) cards used for purchasing money orders. The memo from Walmart corporate that I was given at a store to read through, and that I subsequently wrote about, was not the correct memo. I don’t know if the store that I was in hadn’t received the new policy guidelines yet or if they just hadn’t noticed the new memorandum from Walmart Corporate. Unfortunately the rumors that have been circulating about larger, more negative changes coming to Walmart are true, and the new policies going forward are a clear shot at reigning in manufactured spend inside Walmart. 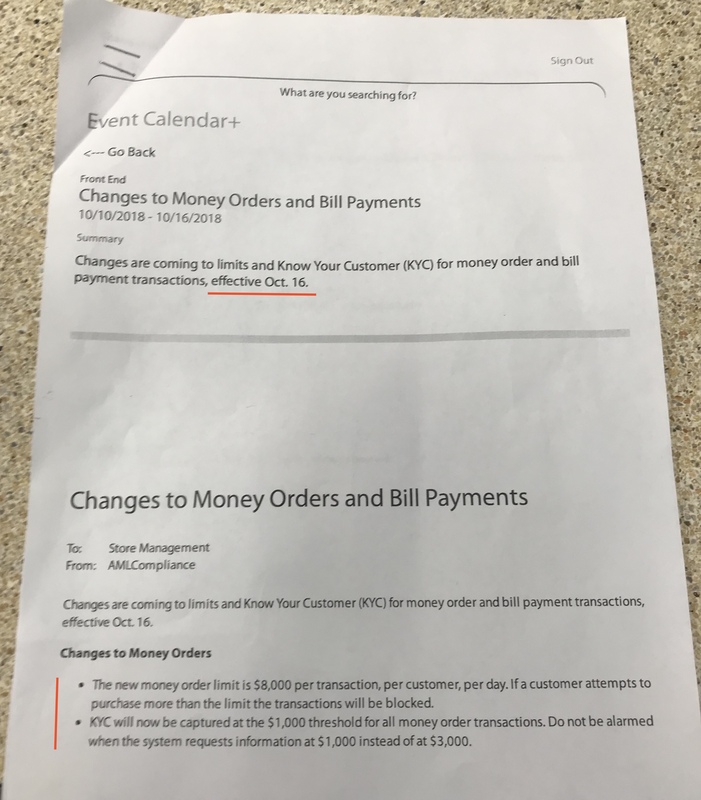 Per the new memo from Walmart corporate, the changes around money orders are set to take place this Tuesday, October 16th. Black Tuesday is coming, and I hope that you’re ready. A somewhat positive change is the language allowing $8,000 per transaction. There’s plenty of downside after that though. After $1,000 has been transacted, the computer will prompt the employee to capture a customer’s information. Before this memo, customer’s information was captured electronically or on paper at $3,000. Many people preferred avoiding giving up their social security number and other personal information, and intentionally stayed under that $3,000 amount. Now customer information will be captured after just $1,000 transacted, I assume into a SAR (Suspicious Activity Report), which is something most customers don’t want any part of. Until I see the new information capture protocols I can’t say for sure, but that’s my guess. There’s also interesting bill pay language in the new memo that says customers will be limited to $8,000 per transaction per 30 days. No idea how Walmart will actually track that, but I’m assuming that some sort of information capture will take place and hard code the system at $8k. 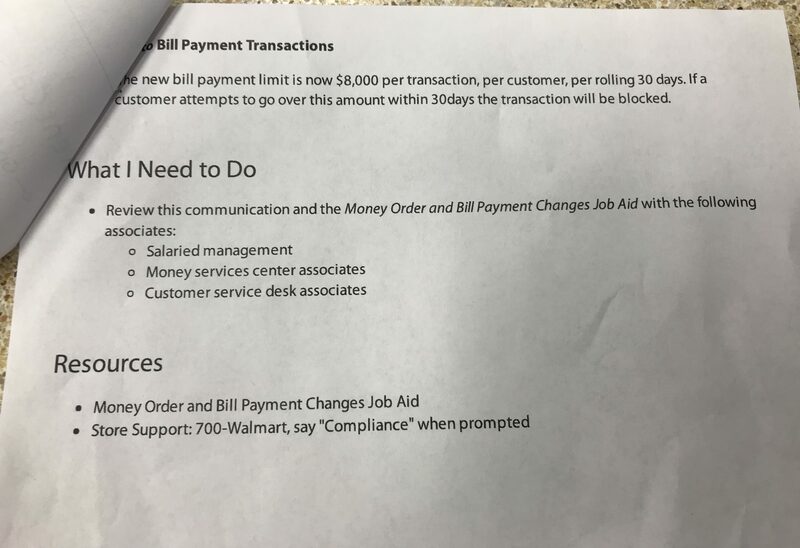 $8k as a bill pay max is in line with information that’s been circulating at some stores well in advance of this memo, but hasn’t seemed to be enforced until now. I assume these changes will be filtered down to all stores via a software update, but this update would have to touch both money orders and bill pay. If you’ve been inside Walmart stores and participated bill pay or purchased money orders, hardware and software don’t always aline perfectly to say the least. The good news is that the points you have just became much more valuable, as earning them in masse is about to get much harder. Manufactured spend just took a major body blow for most casual manufactured spenders, and for the big hitters this is possibly much more severe news. There are still a lot of unanswered questions though, like how widespread these policies will be enforced and to what extent? Will customer information capture take place at exactly $1k, and will that be in the form of an electronic SAR? Will stores that aren’t currently allowing money orders from debit (gift) cards be forced to do so to be in line with corporate policy?